There was a small flock of royal terns on the Captiva, Florida beach just north of Blind Pass and Sanibel Island. It would have been easy to stand and capture distant photos of the flock resting in the sand, but I was looking for something better. By lying down in the sand and moving forward slowly, the beautiful birds allowed me to get quite close without showing any signs of stress. So close that I had to zoom out somewhat to get the framing I selected for the bird in this photo. That the 100-400 L II focuses so closely is a big benefit when the subject is small and you want to fill the frame with it or a portion of it. The close focusing is also useful in situations such as this one – when I got too close. As I said, there was a flock of birds and I was photographing various birds as their positions and behaviors warranted my attention. A low shooting position often has the benefit of a clean background (the sky in this case) and provides a nice angle on most small birds and animals located on the ground. To make shooting while lying flat in the sand easier, I utilized a NatureScapes Skimmer Ground Pod II. To help darken the sky in the background, I used a circular polarizer filter. Early and late in the day sunlight often provides the best lighting for bird photography, but nice images can be made at other times of the day. This royal tern photo was taken at 11:44 AM. At this time of the day, the sun is near its highest point, making shadows harsh and the color temperature of the light cool. By carefully timing the shutter release, I was able to catch bird positions that minimized shadows (especially on its head) and that included a catchlight in the eye. Sunlight reflecting on sand also helps minimize shadows (though not as well as the snow that was on the ground at home on that date does). With a white bird in full sunlight and under a cloudless sky, the exposure decision was easy. Lock in manual mode settings that included a shutter speed fast enough to stop any movement present (there was lots of action happening), an aperture that provided adequate depth of field and an ISO setting that caused the brightest areas of the photo to be *just* below blown (pure white) in brightness. The 7D Mark II and 100-400 L II performed extremely well on this trip. The alert among you will notice that the reported full size pixel dimensions for this image are larger than those native from the 7D Mark II. I framed this bird tight to the top of the frame and used Photoshop's content aware fill to extend the canvas, creating more sky in the final image. This tactic created a modestly higher resolution image overall. Another option for increasing resolution would have been to capture a similarly-focused second frame with more upward angle, taking in much more sky for later stitching to the bird image. I spent hours focusing on these birds and will try to share some additional images when I get time. I took my own advice and left the crazy cold N 40° latitude (-4° F/-20° C) for the warmer weather of Florida and just over a week of (primarily) bird photography. Although I had a 5D Mark III and 1D X along, the Canon EOS 7D Mark II was glued to my hand for most of this trip and the Canon EF 100-400mm f/4.5-5.6L IS II USM Lens was glued to the camera most of that time. As noted in the title, this combination rocked and with relatively-cooperative birds, my take-home is a bit voluminous. 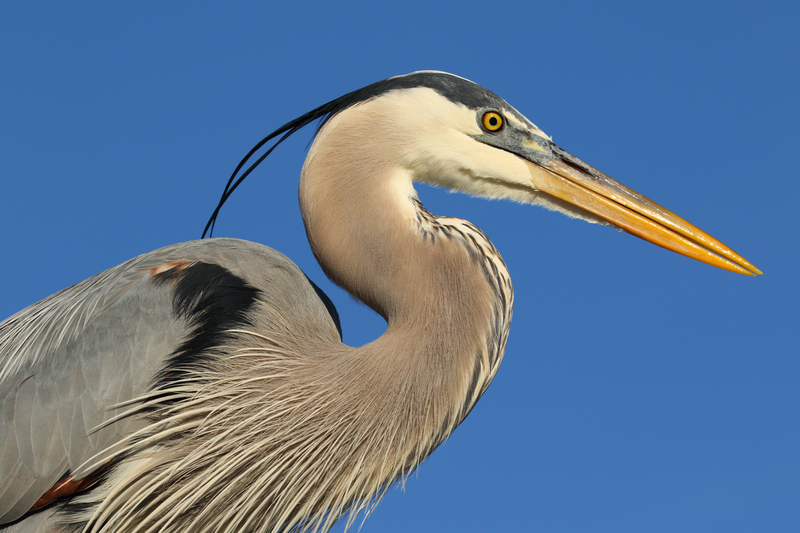 The subject shown here is a Great Blue Heron in breeding plumage. To capture this image, my first priority was to get in line between the sun and the bird with the low, late-day sun creating good subject lighting. By maneuvering to a slightly lower vantage point than the bird, I was able to create a background composed completely of blue sky. No distractions there. A big challenge remaining was to get the bird properly aligned for a pleasing composition. A side-on angle to the bird with the head straight or turned slightly towards the camera usually works great. The challenge in getting that angle was that the bird, especially its head and neck, was constantly moving. I selected the top-right AF point in the center block of AF points (closely aligned with the bird's eye) and when the bird was in a position that worked for me, I quickly captured the image. I was shooting handheld for maneuverability and setup speed reasons. The 7D II and 100-400 L II combo's size and weight are especially nice for this type of shooting. Some are asking if the 7D II images are sharp enough for serious work and I can assure you that the answer is "Yes." EOS 7D II images are very sharp. Because ultimate image sharpness capabilities are not completely discernible from reduced-size images, I have made the full-size version of this image available for download here. You are granted a license to use this image for personal gear evaluation purposes including further processing of the image. This is a 10.2 MB .JPG file that was sharpened very lightly. Sharpen to your taste (perhaps add a little saturation) and then follow the plane of sharp focus through this image to see what the 7D II and 100-400 L II can do. When the landscape is attractive, incorporating it into your wildilfe photography is a great idea. The Canon EF 100-400mm f/4.5-5.6L IS II USM Lens is my go-to lens for this scenario. The focal length range keeps both the animal and the background large in the frame and provides plenty of framing flexibility. A partly cloudy day sometimes provides ideal lighting. This image was captured just before the shadow of a cloud reached the bull elk, leaving the surrounding background dark, helping the bull and its antlers stand out. The Canon EOS 7D Mark II, EF 100-400mm L IS II Lens and a great egret make a great combination. With the egret perched above me and the setting sun behind me, the remaining challenge was to catch the constantly moving bird in ideal positions with AF locked on the eye. The camera and lens performed really well on the latter requirement and my own performance on the former was good enough to land me a pile of shots that I like. What are the ideal subject positions for bird photography? There are many, but side-on to the bird with its head straight forward or turned slightly toward the camera is a basic ideal position. While this bird was directly facing me, that long neck could position the head in a variety of positions and the sideways but turned slightly toward me position worked well in this situation. The gust of wind ruffling the egret's feathers added the extra interest I'm always watching for. Compositionally, I like the two black legs (leading lines) coming up into the frame, positioning the bird at about 1/3 of the way into the frame. The bird looking into the frame adds the needed balance to the image. Cropping the legs (vs. including the entire legs and feet) in-camera allowed the bird's beautiful body to be larger in the frame and allowed me to avoid the background distractions that lower framing would have included. With the wide zoom range available in this lens, I had a large variety of framing options available and I used many. The 7D II's top-center AF point was selected and placed on the on the bird's eye. That the 7D II's AF system covers an area that close to the edge of the frame made capturing this particular image very easy relative to the focus and recompose technique most other DSLRs require in this situation. The great egret's long neck was constantly moving the head to new positions and I had only an instant to catch any of these positions. By the time I would have recomposed after focusing, the bird would have been in a new position most of the time. Though an f/10 aperture used with the 7D II will show some softening due to the effects of diffraction, I wanted as much of the close bird to be in focus as possible. A low sharpness setting of "2" was used in DPP with very light/fine sharpening added in Photoshop CC for a very sharp end result. Even with f/10 selected, I had enough light to use a 1/320 sec shutter speed (though marginal for the moving bird) at ISO 100. My "great" image is basically straight out of the camera with a small amount of bill cleanup done and white balance cooled slightly as the light was extremely warm at the moment of this capture. I know, some of you are thinking that snakes are creepy and that putting any thought into photographing them is ... completely wasted effort. Even if that is your thinking, stay with me here as you can likely apply the same thought pattern to a different subject, one that you find more photogenic. If you scroll your browser past the snake image, you even won't have to look at it while reading. The story starts with me brushing my teeth (you didn't see that one coming, did you?). I looked out the bathroom window and noticed this cute garter snake lying on top of a weeping spruce tree. While garter snakes are common here, they are usually on the ground and are seldom cooperative. So, it is unusual to have the opportunity to photograph them in such a nice environment. The weather was perfect for this opportunity. It was a very cloudy day, meaning that I had soft light to work with and the camera angle decision was not going to be light-driven. After checking to be sure that I could approach at least reasonably close to the snake without it being immediately frightened away, I decided to move forward with an attempt at photographing it. There was no action involved here, so the frame rate didn't matter and the Canon EOS 5Ds R is nearly always my preference in such situations. For lenses, I observed that I had a limited working distance and I knew that getting too close would send the snake looking for a safer location. Interpretation: I needed a telephoto focal length, but not the longest available. I quickly narrowed my choices down to the Canon EF 100mm f/2.8L IS USM Macro Lens and the Canon EF 100-400mm f/4.5-5.6L IS II USM Lens. I decided that the snake would not likely tolerate me being close enough for the macro lens' close-focusing advantage to be a benefit over the 100-400 L II's already very good maximum magnification ability and I wanted to be able to adjust my framing to the positions I was able to get into along with the scene available at that perspective. Basically, I'm saying that a zoom range was preferable. The macro lens' wider aperture would allow me to create a stronger background blur at 100mm, but the 100-400 easily wins the background blur contest overall due to its much longer 400mm focal length and the longer focal length provides a longer working distance at its maximum magnification. I mounted the 100-400 and began working with the scenario available to me. Using a tripod was going to be too great of a challenge due to the in-the-tree location of the snake. Thus, handholding was going to be optimal and image stabilization was once again proved highly valuable. The lighting was relatively constant, but it was changing with enough frequency to make a manual exposure challenging. Also, because I wanted to use a wide open aperture, the variable max aperture of this lens increased the manual exposure challenge. While I still technically used manual exposure mode, I opted to lock in my shutter speed (I was in unstable shooting positions and counting on some assistance from image stabilization) and aperture (I selected f/4.5 with the lens at 100mm and let it auto-adjust to the max available at longer focal lengths) with Auto ISO becoming the auto exposure parameter. Because the colors in the images were relatively neutral, the camera's auto exposure system worked great with the brightest colors, the yellow lines in the snake, being right where I wanted them at the right side of the histogram. When photographing a potentially-fleeting subject, I quickly capture some good-enough images to have the safety shots on the card. Along with having those safety shots, I can quickly check the exposure and other settings before moving in closer. Upon reviewing these images, I immediately noticed that reflections were impacting color saturation on the snake and that meant a circular polarizer filter would, as it frequently does, provide a significantly improvement in image quality. I slowly backed away from the snake and went back inside to get the filter. With the filter installed and properly adjusted, I was happier with the results and began to work the composition more seriously, including approaching closer to the snake. Finding the proper perspective is often the key to creating the best composition and the longer I photograph a subject, the better I can determine what the best perspective is. Moving closer/farther, up/down or around the subject can significantly change the juxtaposition of the subject and its surroundings, significantly changing the resulting image. To jump start the composition process, I wanted the snake's head to be facing in a direction other than away. That factor eliminates about half of the potential camera positions. A sideways-facing head can work well and a slightly-toward-the-camera angle is usually a great choice. That the snake was on top of the tree removed much of the below-the-subject camera position options. The background is always a huge key to good composition and using a telephoto focal length is useful in both reducing what remains in the background and blurring what remains into obscurity. I adjusted my position to take in a variety of background colors and textures and also worked my position around the snake to get different angles on the main subject. Eventually I went for a step ladder and tried some downward angle compositions for some variation. Another compositional opportunity available to me was that, with no discernable horizon or other sense of levelness showing in the frame, I was free to rotate the camera as I desired and that adjustment could change the entire balance of the snake in the frame. Every so often the snake would move slightly and I was able to work with a modified scenario for a period of time. The snake cooperated for about an hour – long enough for my arms and shoulders to get tired from holding the camera in awkward positions. Then the snake abruptly dropped from sight and it was game-over. As so often is the case, the 5Ds R and 100-400 L II proved to be the perfect combination for this purpose. With a bit of unexpected rain occurring during this shoot, I was happy for the camera and lens' weather sealing protection, meaning I could simply keep shooting without worry in that regard. Just an hour of shooting not only gave me some of my best-ever garter snake pictures, but it also provided a great practice session. Simply spending an hour photographing something that interests you around the house can keep your photography skills fresh along with teaching you new ones. So, get out there! What was the hardest part of this capture? It was not the exposure. With a solid cloud cover, I was able to lock in a manual exposure for perfect results on every shot. In this case, I chose a 1/1000 shutter speed (the bird was moving a lot and quickly), an f/5.6 aperture (to isolate the bird using shallow depth of field) and ISO 160 to bring the brightest whites up to near RGB 255,255,255. The challenge was not the tight framing of the bird. I was able to slowly belly-crawl close to the small flock of terns. So close that I only needed a 234mm focal length in front of the 7D II's APS-C sensor. I should have used a slightly wider angle still as I added a small amount of canvas on the left in post, providing additional breathing room for the wing. The challenge was also not the low shooting position. Using the NatureScapes Skimmer Ground Pod II, I was able to push the camera forward as I crawled in the sand. Shooting from on the ground gave me a clean background (only sky) and the remaining land in the frame is primarily a blur of texture. The big challenge? Timing the shutter release in conjunction with using the proper AF tactics to get this specific composition with the head included in focus. The sandwich tern cleaning process involved a wide array of moves, few of which I was able to predict and all of them fast. The head was constantly moving in what seemed like all directions and fast framing adjustment with a properly-selected AF point proved very challenging. A narrower aperture would have reduced the AF task, but the result would have been more ground in focus for a different look. One aspect of this image that I like is the complete separation of the head from the body. Many of the preening positions did not have this attribute (and many had a completely hidden head). I also like the balance. While I don't often place my subject in the center of the frame, I felt that centered worked best in this case. The wing and tail balance the bird over the dark, eye-catching legs. The head extended to the right caused me to want the legs shifted just left of center to get what I felt was the right overall balance. My shooting position was low enough that only the legs intersected the color of the sand. The small amount of feather pulling through the bill is the bonus feature. I'll credit the 7D II's short shutter lag for enabling that timing. This sandwich tern was on the gulf shores of Captiva Island, just north of Blind Pass. This location in southwest Florida is ideal for expanding one's bird photography portfolio. Don't like shooting in the extreme heat and humidity of summer? Be like the birds – migrate! For most of us northern hemisphere residents, the preferred direction is north. I was recently privileged to do just that, spending a week 26 miles from the grid in the North Maine Woods, just below the Canadian border. The temperature here in late July was very pleasant during my entire stay. The North Maine Woods are sometimes referred to as the "Silent Woods" by my family, referencing specifically the lack of crickets, cicadas, katydids, etc. making the loud night music we are accustomed to at home. But that declaration is not completely true. Along with some frogs, the clear, eerie call of the loon is a common night sound heard around the silent, pristine northern Maine lakes. It is a sound that I love to hear and a photo of that audio source brings back great memories. I have photos of common loons, but ... none that stood out to me. I have wanted change that problem on this trip and to do so, I spent just over hour early each of four mornings attempting to photograph these beautiful birds. My craft was a canoe. Being solo in the canoe with light and changing winds added to the challenge of positioning for the photos. Getting close enough for adequate frame filling while positioning between the loons and the sun all while not concerning the not-too-tame birds was not easy. A light wind being able to rapidly turn the canoe was definitely not helpful. My case was a Pelican. As it is only fitting to use a case named after a bird while photographing birds, I stored the camera and lenses in a "Pelican" 1510 while in transit between shore and actively photographing the birds. While the Pelican case lacks official approval as a PFD, it floats very nicely in the event of a worst case scenario. There was no worry about water from the paddle dripping on it and no worry about water on the floor of the boat reaching the gear. The Canon EF 100-400mm L IS II was my Lens choice for these outings. While a 600mm lens would have been more ideal from a focal length perspective (due to the distance that the loons were comfortable with), it would not have been easy to handle this lens in the canoe, especially when alternating between paddling and photographing. The 1.4x behind the 100-400 L II would have also been helpful, but ... that option was not available to me. The Canon EOS 5Ds R was my camera choice. Having the tremendous resolution of the 5Ds R allowed me to crop deep into the frame with significant pixel dimension remaining. At least 24 megapixels remained in most final images and some required no cropping for a frame-filling loon. Framing loosely had some advantages. For one, the loons were seldom still. And, by sticking one leg straight out the side, loons can change directions 180° almost instantly. That is much faster than I could change the canoe's direction and faster than I could change an AF point to the opposite side. With the center AF point locked on the bird's head, I was ready for any direction change with the bird (often) remaining (relatively) easy to keep entirely in the frame with only slight recomposition needed. While I cropped the loons rather tightly in most images, being able to go back to the RAW file means that I can open images up if/when more space is needed around the birds such as for titles and text. The background, primarily reflections of the forest with some sky, are beautiful in their own right and in this photo, I especially liked the reflected colors of the forest being hit with early morning light. The white birch tree reflection is another key location identifier to me. Photo trips such as this one provide extremely educational firsthand experience. One of my take-aways from this loon photography experience is that loons blink a LOT after surfacing into bright sunlight. Once I noticed that behavior, I was careful to time the shutter release with an open eye (and utilized burst mode more frequently). Crossing this photo off of my bucket list was not a small effort (some might say that I went "loony"), but the pile of keeper-grade loon images I brought home was a bit daunting to sort through. Selecting the one to share with you first was an even bigger challenge. Being in a far north latitude meant that this effort was "no sweat." Cookbooks are filled with successful recipes and successful bird photography is similarly not limited to a single recipe, but here is a recipe that works every time. 1. Start with a great camera and lens. The Canon EOS 7D Mark II and Canon EF 100-400mm f/4.5-5.6L IS II USM Lens are excellent choices. 2. Find a beautiful bird properly posed against a clean background. A snowy egret in breeding plumage easily qualifies for this main ingredient. A practically uninterrupted clear blue sky background frame keeps the viewer's eye on the main subject. 3. Time the bird meetup with an early or late day sun at your back. Lighting is one of the most important ingredients to any photo. Early and late day direct sunlight, generally warm in color and slightly diffused in hardness, is a highly desired source of light. The 5:50 PM light was so warm in this case that I decided to cool the 7D II's AWB (Auto White Balance) choice very noticeably in post processing. Because the sunlight was directing my shadow toward the bird, subject shadows are very minimal. 4. Cue a side or tail wind to ruffle the bird's feathers. Birds like to face the wind, keeping their feathers in line. When a side or tail wind presents itself, I like to take advantage of it. The ruffled feathers add a character to the image and in this case, the wind pushed the breeding plumage into better view. Birds are often constantly moving and timing the shutter release, in conjunction with balanced framing and accurate AF, is a challenge. With the 7D II's wide-set AF points, I was able to select a point that covered the bird's head without recomposing needed. When the bird turned its head to the side, I quickly pressed the shutter release and the 7D II's short shutter lag did not get in the way. Compared to the effort required for many of my photos, this was a very easy photo to capture. Being at the right place at the right time to apply the recipe was all that was needed. You are looking at one of the first pictures ever taken of "Denali", the highest mountain peak in North America. While that statement is fun to say (and true in a sense), a tremendous number of photographs have been taken of this mountain long prior to my arrival. However, the mountain's name was "Mt McKinley" from June 1896 until about just before I arrived. On August 28, 2015, Sally Jewell, US Secretary of the Interior, announced that the mountain would be renamed "Denali" (Wikipedia). Two weeks later, my opportunity to photograph this mountain came. With an elevation of 20,310' (6,190.5 m), the peak of Denali can be seen be seen from at least 125 miles away – on a clear day. The last part of that sentence is a key one. Getting close to this mountain (for most) requires a shuttle/tour bus ride deep into Denali National Park's 92 mile mostly-stone road. Even those making the effort to get deep into the park stand only a 30% chance of seeing this mountain's peaks due to the clouds that frequently engulf it. I spent a large amount of time planning and traveling to get to the location for this image and was blessed with a beautiful day for my long-in-advance-scheduled tour (after a morning snowstorm, the sky even cleared enough on my backup day to make the peaks visible once again). With the weather cooperating, taking the actual photograph was easy part. I selected a manual exposure that would make the sunlit snow at the top of the mountains nearly pure white (barely blinking in the camera LCD) while using an f/8 aperture (for ideal sharpness and depth of field) and ISO 100 (for noise-free images). The resulting shutter speed of 1/160 was adequate for resting the awesome combination of the Canon EOS 5Ds R and the Canon EF 100-400mm f/4.5-5.6L IS II USM Lens on my backpack. With the ideal exposure locked in, I was free to quickly capture a variety of compositions of this incredible view during the 15 minute shuttle bus stop, with all being ideally exposed. In the end, I merged two images to add a couple of hundred pixels to the right and left sides of the base images, giving the side-to-side balance that looked right to me. I usually have a circular polarizer filter mounted when I'm photographing landscapes and usually note this use in the notes below relevant image posts. But, I want to make special mention of CPL use here because of the significant difference it made in the deep saturation and contrast of the foreground of this image. Like no other, this filter can add WOW! to your images. Under a cloudy sky, the lighting was right at any subject angle and throughout much of this day at Blind Pass in Captiva, Florida. This giant softbox-like lighting permitted me to maneuver to the ideal angle for this subject (from the side) and the NatureScapes Skimmer Ground Pod II allowed me to comfortably work from right on the sand. This low perspective caused the background content to be farther away. That distance, combined with a long focal length and close primary subject, meant that the background became significantly blurred. When it becomes a blur, the background's color and shapes become the primary concern. In this case, the ocean was my background. The wave patterns, including breaking waves, supply the gently-changing color and shapes. When the ocean is in your frame, shutter release timing often matters as the ocean is constantly changing. A wide variety of waves shapes worked well for this situation, but my final selection included not only the willet with ideal head and body angle, but also with most breaking waves (white color and shape) avoiding the bird's outline. As I've said before, the Canon EOS 7D Mark II and EF 100-400mm f/4.5-5.6L IS II Lens make a great birding combo. With plentiful wildlife and beautiful scenery, Katmai National Park ranks very high on my list of favorite places to photograph. In this photo, the large, bare, coarse-edged mountain peak, the more-gently sloping mid and lower elevations covered in green, and the various waters below, all being large in the frame, are obvious to the viewer. With a little more attention paid, a sow and her standing cub, concerned about the risk presented by the boar that is eyeing and potentially approaching them, come into view and give the photo that extra element I always like. Additional elements (and not as visible at this resolution) are the large number of salmon splashing their way up the stream in the foreground and a pair of brown bears on the distant shoreline. The Canon EF 100-400mm f/4.5-5.6L IS II USM Lens was practically glued to one of my Canon EOS 5Ds R bodies while in Katmai NP and a great complement to my big lens, the Canon EF 600mm f/4L IS II. 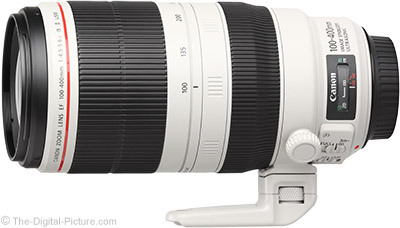 The 100-400 L II, with its long focal length range, can capture wildlife images ranging from environmental portraits to close-ups, depending on the subject distance of course. That 100mm was nearly too long to frame 1,000+ lb brown bears at times was ... a very exciting part of this trip. The first thing you reach for when a rainbow shows up is of course a camera, but ... what is the first lens you reach for? Probably one with wide angle focal lengths, enabling you to get as much of the rainbow in the frame as possible. That is often a great choice, but ... what if the landscape does not support a wide angle composition? Especially if you find rainbows intriguing (where else can you find the entire visible spectrum separated and displayed brilliantly? ), you will, over time, likely accumulate many average rainbow photos. These will have a narrow arc of color running through the image with whatever scene happens to be in front of you at the time, including houses, streets, power lines, etc. The rainbows always look great, but eventually ... something more is needed for the image to be worth keeping. With plenty of average rainbow images on my hard drives, I now often keep driving, working, etc. while admiring a rainbow as a so-so landscape is no longer a good enough supporting background. Especially when facing a rainbow with a just-average landscape surrounding it (or, when there is a partial rainbow), consider grabbing a telephoto lens to photograph it. With a narrower angle of view than wide angle lenses, telephoto lenses can make great images with a less scenic background available, allowing the rainbow's beauty to be isolated from less-desirable surroundings. If the sun is high enough, a short telephoto focal length (70mm in that example) can even keep some of the arc in the frame. Zooming in to 150mm permits more surroundings to be excluded (an entire town in that case). For the image I'm sharing here, I zoomed to the longest focal length I had available. A benefit of that 400mm focal length was that the amazing colors of the rainbow filled a much higher percentage of the frame than a wide angle focal length would have provided. It also made the sheets of rain more prominent within the rainbow. Yes, an even longer focal length would have filled an even higher percentage of the frame with color and 600mm through 800mm focal lengths should also be considered for rainbow capturing at times. But, as mentioned, I didn't have a longer lens available. However, a benefit from having 50 megapixels of resolution is that this image can be cropped considerably and still retain very high quality, a result that can still be output to a large size. While I contemplated cropping (and still may create that variation), I decided to share this one as-captured with additional elements supporting the color. I like the ocean providing a base and context for the storm and the shading variations to the sides of the rainbow help indicate the heavy storm's presence. The heavy, dense rainstorm approaching over the Atlantic was a welcomed sight on this afternoon (from an imaging perspective at least). The direct sunlight reaching the storm created an intense display of color that lasted long enough to ... allow me to create more images than I needed. I admit to capturing some wide angle images of this scene with the lens I was already using prior to reaching for one of my favorite telephoto zoom lenses. After installing and adjusting a circular polarizer filter, I captured a variety of images, including both camera orientations, a variety of focal lengths and sometimes with clouds passing in front of the rainbow worked into the compositions. This rainbow image was captured in North Caicos, but aside from the water color, it could have been over any large body of water. I mentioned that wind was an issue on this entire trip and, with a storm approaching, the wind was especially strong while photographing this rainbow. With the sun at my back and the wind in my face, I left the lens hood in the pack. The filter was completely shaded by the lens and large hoods become a source of vibration in the wind. I sat on the ground with my elbows on my knees, my left hand holding tightly over the lens mounted to a retracted Really Right Stuff TVC-34L Carbon Fiber Tripod. With the camera's eyepiece pressed against my eyebrow, the setup was completely locked down and my sharp image rate was nearly 100%. Rainbows are made possible by the right weather conditions and ... the weather can be unpredictable. But, when your next rainbow shows up, consider chasing it with your telephoto lens. There is no shortage of mountains in Denali National Park. However, a layer of snow adds greatly to how they look. Snow especially contrasts against the darkest-colored mountains. Bright white snow and very dark rock can potentially be an exposure challenge. When photographing landscape under full sunlight with snow in the frame, setting the ideal exposure usually involves bringing the image brightness level up to the point where the brightest snow has a tiny area of blinkies showing on the LCD (be sure that these are enabled). This insures that detail remains in the snow while shadow/dark areas have as much color information as possible. You may have noticed that this image is not showing as full-dimensioned for the Canon EOS 5Ds R used to capture it. This image was not cropped (the 100-400mm lens was not set to its longest available focal length), but as is often the problem with long distance photography, heat waves caused enough degradation that I opted to reduce the image size by 66%, using downsampling to improve image sharpness. Note that I did not use a tripod for this capture. This lens' image stabilization system combined with a solid three-point sitting position (elbows on knees and forehead pressed into eye cup) were very adequate for sharpness in this regard, and a B+W HTC circular polarizer filter blocking less light than a standard filter also contributed to this run-and-gun shot. While this beautiful bird had its eyes on dinner, I focused on getting a tight headshot with blue sky framing. The bird was in constant motion, so I aligned myself with the sun and held the single selected focus point (one to the right of top center) where I wanted the bird to be in the frame. As soon as the head turned to align with my vision for the shot, I pressed the shutter release. While my timing and/or framing was not successful on every attempt at this image, I really only needed to nail one of them. Persistence paid off. The sky was clear (late in the day) and that meant the required exposure was not changing quickly. Stable exposure needs combined with a bright white subject shout "Manual Exposure" to me. I selected a manual exposure setting that made the brightest whites nearly blown and reduced brightness by 1/6 stop during post processing. The sharpness of this image, captured handheld on the pixel-dense 7D Mark II with the 100-400 L II at 400mm, is really impressive. I see a lot of images, including a lot of sharp ones, but what I see here catches my attention. I highly recommend this lens (and camera), especially for birding and wildlife. Obviously, there is one less tree on the ranch. While I mostly used the Canon EF 600mm f/4L IS II USM Lens on this elk photo trip, there were times when I was really glad to have the Canon EF 100-400mm f/4.5-5.6L IS II USM Lens readily available. In this case, thanks to the zoom range afforded by this lens, I was able to capture both full-body images and close-ups in rapid succession. This huge rutting bull rocky mountain elk was in the bottom of a valley that had long been in the shade from the setting sun. He was intently tearing up this tree, which meant that I needed a fast shutter speed to stop the motion. My choice of 1/1000 was certainly not overkill, but I wanted to keep the noise levels down as much as possible. The 5D IV's ISO 5000 looks good enough that choosing an even faster shutter speed would have been a non-issue. With the upward head angle, it was almost as if I was lighting the 8x7 bull with a huge softbox in the studio. I love images featuring patterns and textures and thought I would share one today. One way to find patterns is to look for large numbers of a similar subjects (practically anything qualifies) that are close together or can be moved close together. Photographing patterns is often quite simple once the pattern is found. Orient the camera as ideally as possible for composition and lighting and then zoom in (or adjust your distance) so that the pattern fills the frame or fills the desired portion of the frame. There are few rules (the subjects may not even need to be in focus), individual tastes vary widely and there is plenty of room for creativity. I am especially fond of patterns/textures that occur naturally. When this flock of snow geese took to the sky, it was a matter of zooming to appropriate focal length and photographing the most-dense area of the flock. The thousands of white, orange and black birds against the blue sky resulted in a bright, colorful image. So, on this day, a frame filled with a random pattern of snow geese worked for me. While texture and pattern images will not usually become the most-liked in your social feeds, they can work very well for wall art, in commercial advertising and for a large variety of other purposes. And, if you like them, that is reason enough to create them. The snow line usually marks the elevation above which there is snow, often forming snow-capped mountains. On this morning, the snow line was below the mountain top. I had just spent two hours in the tractor cab taking care of snow removal duties and was then able to concentrate on capturing some fresh snow images. My studio overlooks a valley and a small mountain ridge. The snow came with a strong wind from the opposite side of that ridge and above the ground line, the windswept trees remained bare while the lower elevation trees, protected by the mountain, were heavily snow-laden. The snow/no-snow line was strong and I was drawn to the contrast. The mountain was roughly 1,500 yards (1,500m) away and I could see over a mile (1.6 km) of it in width. This meant that the primary interest for me was strongly horizontal. I could photograph using a wide angle focal length and crop the top and bottom off to get just the strong line of bare trees over the snow line, I could capture multiple frames at a longer focal length to later stitch into a panoramic image or I could go with a telephoto focal length and frame tightly. I chose the telephoto lens option and began isolating specific areas of mountain. My lens choice was the Canon EF 100-400mm f/4.5-5.6L IS II USM Lens and mounted it to the being-reviewed Canon EOS M5 via the EF-EOS M Adapter. The storm was clearing and periodically, the sun was shining through breaks in the clouds. The areas of snow in the direct sunlight became especially bright and the partial illumination created additional interest within the already interesting scene. When available, the partially lit portions of the scene were my focus. Often, photographing scenes this far away results in details being strongly affected by heat waves, but on this crisp, clear morning, the M5 behind the 100-400 L II delivered very sharp image quality, even at this distance. Notice that photographing subjects from very long distances always results in a compressed look with less perception of depth (trees farther away appear similarly-sized as closer trees). This attribute can be good or bad depending on the scene, how the composition comes together and the viewer's taste. While the circular polarizer filter was not making a noticeable effect, I had it mounted in case blue sky opened up and I note its use for those questioning the exposure settings. I was in coastal Katmai National Park primarily to photograph brown bears feasting on salmon, but the landscape was also very impressive. As the light faded on the bears, clouds settled into the mountaintops and the setting sun brightly lit the clouds not shaded by the mountain. Direct sunlight just before sunset (or just after sunrise) is warm in color and very significantly warmer than the light in shaded areas. I often like that difference in color. While I carried a wide angle zoom lens along with me on the bear treks, primarily to use for landscape photography, it was not the right lens choice for this scene. My subjects were mountain tops and I wanted them large in the frame. Meeting this goal calls for telephoto focal lengths and the Canon EF 100-400mm f/4.5-5.6L IS II USM Lens I primarily intended for wildlife use worked perfectly here. Sometimes capturing a great landscape image with a telephoto lens seems too easy. While the 100-400 L II is not a small or light lens, it is usually with me when photographing landscape exclusively. This is an extremely versatile lens that delivers very impressive image quality.